Today, Canadian star Andrew Wiggins, the consensus Number One overall high school prospect in the nation finally announced where he will be playing ball next year. Many thought he might head to Kentucky, where John Calipari landed six of the nation's elite high school players or maybe even Florida State who is pretty new to landing superstar recruits. But, in the end Wiggins decided it was in his best interests to head to Kansas next year. With a team losing seniors Jeff Withey and Elijah Johnson, the 6-7 forward Wiggins should be the star for the Jayhawks immediately. 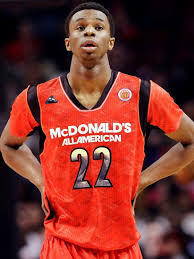 Wiggins averaged 23.6 points, 4.3 assists and 11.7 rebounds per game last year for West Virginia's Huntington Prep. Wiggins has the perfect set of skills to make a great transition to Kansas and the rest of the Big 12. He can score easily using his big frame and amazing athleticism to get to the rim and also is a pretty solid shooter. He also proved to be a more than capable rebounder getting to the ball quicker than anybody else. Wiggins has also proved he can play a guard role, seeing the floor well and playing great defense. Coaches other than just Bill Self are really high on him as well. Iowa State head coach Fred Hoiberg explained "He's the best high school player who has come around in a long time." Wiggins should only strengthen Kansas' already fantastic recruiting, one that should rival Kentucky as the best in the nation. Although the Wildcats landed the Harrison twins, James Young and Julius Randle Kansas landed their fair share of talented prospects. Wayne Selden has proved he can score at any level and the nation's top center Joel Embid is already on board. It appears Wiggins should be drafted number one overall in the 2014 NBA Draft. The last few Number One prospects in the land, in order, Nerlens Noel, Anthony Davis and Harrison Barnes have all gone in the top 10 in the last few drafts (assuming Noel does indeed go in the top 10 which he likely will). Scouts should love his athleticism and size. Right away Wiggins should join next year's list of Wooden Award candidates that include Louisville's Russ Smith and other high school prospects such as Randle, Duke's Jabari Parker and Arizona's Aaron Gordon. Any way you look at it Kansas and Wiggins should be ready for a dream 2013-2014 season.